Proper urban planning for Yangon must be a top priority, and is absolutely essential if it is to be a truly great 21st century city. 1. Yangon will remain Myanmar’s biggest and most important commercial city for decades to come. With rapid urbanization the city’s population will grow by several million. Getting Yangon right is critical for the future of the entire country. Yangon can be either a driver of economic growth and one of the most livable cities in Asia, or it can easily descend into an urban disaster that will drag down the rest of Myanmar. 2. Because of isolation and low-economic growth for many decades, Yangon became a city “frozen in time.” This has left Yangon with an unparalleled collection of 19th and early 20th century architecture, from old teak homes to downtown buildings that once housed multinational corporations like Standard Chartered and HSBC. We have streetscapes and views that no longer exist anywhere else. This provides a tremendous opportunity that no other city in Asia has—to combine old and new in a way that makes Yangon unique. If we destroy this now, it will never come back. 3. Downtown Yangon in particular is an extraordinary global heritage area. Within its few square miles are dozens of different religious sites of all faiths. Its architectural collection is special. It’s the single most important landscape in Myanmar history, where our anti-colonial movement was born and where the country’s greatest political leaders, artists, and writers lived and worked. Global history was made on its streets. 4. Over the coming 10-15 years, what Yangon will need most is infrastructure, including electricity, Internet connections, airports, ports and roads to move its economy forward. But hopefully, 15 years from now, we will become a medium-income country. We will then be competing with Hanoi, Jakarta, Chennai and Chongqing, to attract talent, grow creative businesses, and make Yangon a center of innovation. At that point, a beautiful old downtown with bookstores and cafes and galleries as well as centuries-old communities and religious sites will be an incredible asset. It will be worth tens of billions of dollars. It will make all the difference for Myanmar’s future. 5. And what is important to preserve is not just downtown Yangon. Yangon is first and foremost the city of the Shwedagon. The area around the Shwedagon and views of the pagoda should also be rigorously protected. It will be a World Heritage Site. It is already Myanmar’s great treasure and must be central to any urban planning process. 6. We also have a waterfront with amazing potential. Yangon is a city surrounded by rivers yet the public have very little access to the waterfront. If the ports can be moved in a phased manner to Thilawa, the waterfront can be remade into a first-class destination for both residents and tourists. There could be convention centers, restaurants and shops, and most importantly areas for sports and recreation. The city would be a much healthier and happier place. 7. What will also make Yangon a much healthier and happier place is to protect and expand public spaces generally, especially green areas, and to broaden the pavements and make walking easy. The Inya and Kandawgyi lakes should also be central to the vision of the city going forward and the areas around them will require careful management and protection from commercial development. Walking downtown is now becoming increasingly difficult and the narrowing of pavements is a mistake that needs to be reversed. 9. In thinking of tourism, we should remember that there are dozens of possible tourist sites that remain virtually unknown. Places like the Armenian Church on Merchant Street or Ching Tsong Palace or the Pegu Club would be top destinations in other cities. We should remember too that what tourists (especially high-end tourists) want is to see culture and ordinary life. Making downtown livable for people living downtown should be the cornerstone of a tourism strategy. 10. Nothing I have said so far should suggest that I am against high-rise development. On the contrary, I think very dense development is essential. I would rather keep Yangon compact than see an urban sprawl. Areas just east and west of the old downtown and the area around the railway station could easily see high-rise development. 11. Urban transport will be an enormous challenge going forward. The priority should be pedestrian and public transport, buses in the short-term, rail in the longer term. New roads will be essential but prioritizing private car traffic at this time would be a big mistake. It is already worsening daily life for millions of people. 12. One of the questions I am often asked on conservation is, “Who will pay?” That is the easy part. There is tremendous international investor interest. We could easily attract a billion US dollars for the renovation of the old buildings downtown. The challenge is in directing this investment in a way that will benefit not just the city as a whole but also the families who live downtown. There are many possible schemes and public-private partnerships. For example, investors leasing a building long-term could be required to fund the renovation of many other medium- and low-income owned buildings nearby. The move of the government to Naypyitaw means that dozens of government-owned buildings are now only partly used or empty. This provides a tremendous opportunity but it also requires a plan. 13. The biggest challenge to downtown renovation is not actually financial but legal. As in the rest of the country, ownership issues are extremely messy. But some progress in clarifying ownership of buildings downtown will be essential for moving forward. 14. Over the past few years the Japanese government has drafted a “master plan” for Yangon. They should be commended for this. But this is primarily an infrastructure plan, it does not incorporate what is unique about our city and offer a comprehensive vision for the future. In early 2012, I founded the Yangon Heritage Trust (yangonheritagetrust.org) to try and work with the government to protect the old colonial buildings downtown. But over the past two and a half years, I have realized that what we need is a much broader urban plan that integrates our architectural heritage into a vision of a 21st century Yangon. 1. An integrated strategy for the reuse of government-owned buildings. Some (like Yangon General Hospital or the High Court) should remain government buildings. Others could be leased on a long-term basis. But what is extremely important is that before they are leased there is a Conservation Management Plan that states clearly what can and cannot be done with the building as well as a mechanism to monitor compliance. We are extremely pleased that the Yangon government has asked us to work on a CMP for the Secretariat and hope that this might be a model for the future. What is also important is that decisions on the future use of government buildings are placed within an overall strategy that matches need (for example, for more hotels or apartments) to building design (not all are suited, for example, to be a hotel). 2. A tourism plan for downtown Yangon. The immediate economic benefits to residents downtown and to the Yangon economy generally would be considerable. It is a “Quick Win.” The Yangon Heritage Trust is starting to place blue plaques on buildings of historic importance. We are offering new tours (free in the Myanmar language). What is critical for tourism is to make downtown walkable again as well as clean up as many of the streets and alleys and upgrade market and restaurant hygiene as much as possible. Again, making downtown livable for the people who live downtown is what will make downtown a great destination. 3. A “Special Development Plan” for the old downtown. This would unite a strategy for government-owned buildings downtown with schemes from privately owned heritage buildings , a tourism plan, and other components to improve the quality of life for the people who live downtown. Yangon is at a crossroads. What is at stake is billions of dollars in investment, tens of billions in future income, and the very way in which people will live and work. The decisions made over the coming months will shape the city and the country for the rest of the century. 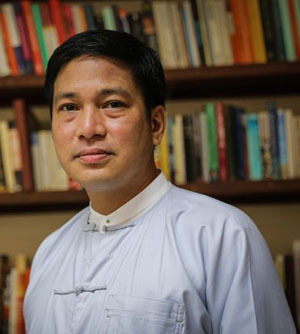 Thant Myint-U is founder and chairman of the Yangon Heritage Trust.